Bali is on top of popular destinations for travelers in Southeast Asia. Not only bring beautiful natural beauty, the island also owns a special culture. People often refer to Bali as “Island of the gods” because here, in the temples of Bali, people worship a lot of gods, with many mysterious legends that you should not miss when going to Bali. These are top 10 places to visit in Bali for a wonderful trip. Tanah Lot Temple is one of the most beautiful places to visit in Bali, famous for its unique offshore setting and stunning sunset views. This is an ancient Hindu temple located on the top of a rock that stands out among the blue sea and the rippling waves. 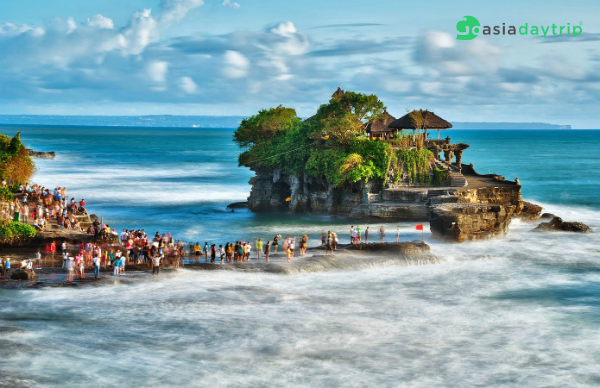 The onshore area is littered with smaller temples offering recreational facilities catering to Bali tourists, including: restaurants, shops and cultural parks that perform regular dance performances. 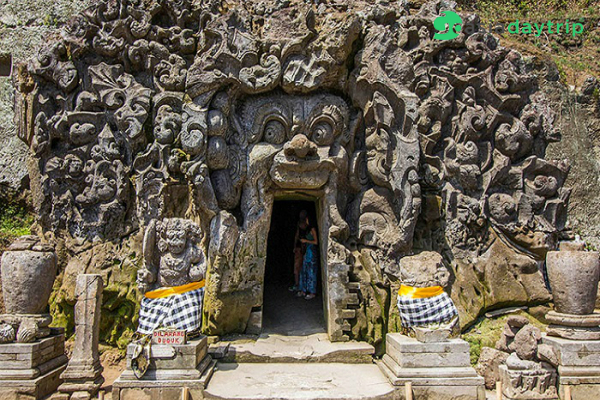 The temple is located in Beraban village of Tabanan sanctuary, about 20 km northwest of Kuta, and is included in most trips to the western region and central Bali. Uluwatu Temple or Pura Luhur Uluwatu, one of the six main temples considered as the spiritual pillar of Bali, is well-known for its superb location, situated on a mountain top about 70 meters above sea level. The temple attracts visitors by traditional Balinese architecture and ancient sculptures. The temple also shares the beautiful sunsets of Tanah Lot. Thus, Pura Luhur Uluwatu is definitely one of the best places to visit in Bali for sunset, with direct views of the beautiful Indian Ocean and daily Kecak dance performances. 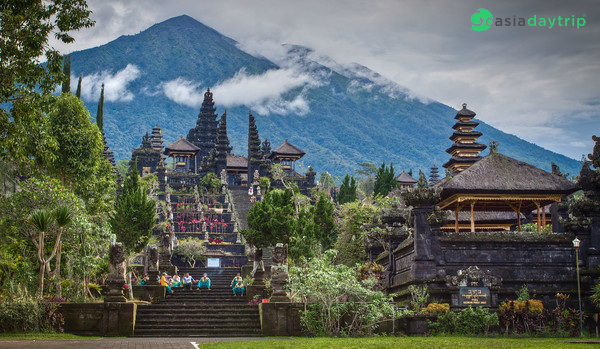 Besakih Temple, called the Mother Temple of Bali for over 1,000 years, is located at 1,000m altitude on the southwest ridge of Mount Agung. Besakih is a unique artistic complex comprising at least 86 temples, including Pura Penataran Agung and 18 other cities. Thus, according to the experience of many people, Besakih is the largest and most sacred island of the temples and is surrounded by rice paddies, hills, mountains, streams and many other things. 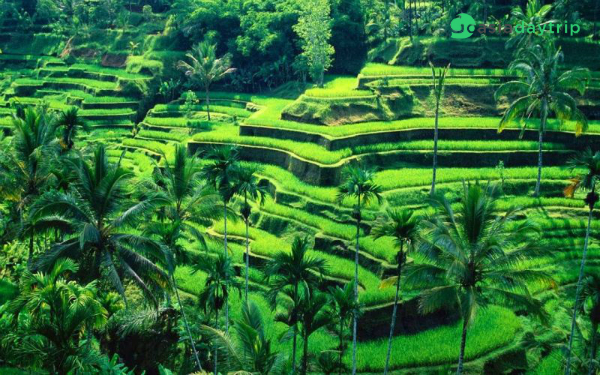 Tegallalang Rice Terraces in Ubud Indonesia is famous for its beautiful rice fields in relation to Subak. Tegallalang is made up of three of the most beautiful landscapes, including Ubud terrace rice field, Pejeng vilage and Campuhan village. The terrace rice fields of Tegallalang provide a magnificent view of the rice fields on the slopes through the valley. The location is cool and airy and this is a famous place for tourists to stop and take pictures. Painters and nature lovers also enjoy this place. There are many art shops and cafes near their pottery showcases. 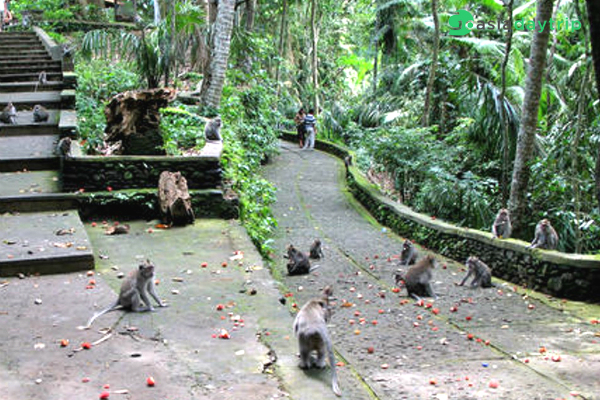 If you are wondering what to play in Bali, Ubud Monkey Forest is a good suggestion. This place is known as the sacred Monkey Forest of Padangtegal, one of the most famous sights of Ubud. A protected nature reserve is home to gray long-tail monkeys. This area is well preserved thanks to the community-based management program. Staying at the Ubud Town Center, within walking distance of the motels and resorts along the main roads of Jalan Hanoman, you will easily visit the Jalan Monkey Forest. Besides watching the fun monkeys in their natural habitat, swinging through the trees, wading along the dirt road or eating bananas, this has a cool walk along the paved path through a vineyard. 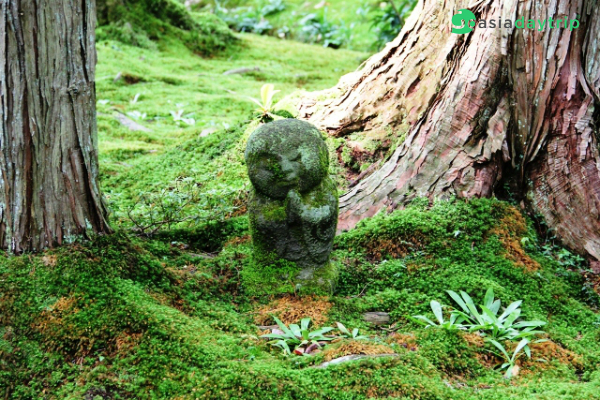 Beautiful ancient statues covered with moss. In the Indonesian tourist guide, Ubud often selects the Ubud Monkey Forest as a stopover to visit, combining with prominent highlights such as the Ubud Royal Palace and the shopping malls through the expanding Ubud Art Market. a 10-minute drive away. 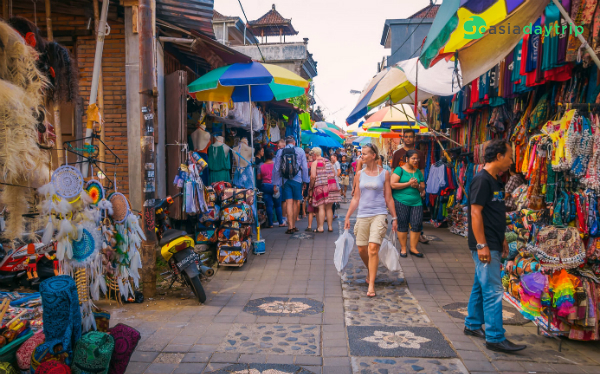 If you want to buy something in Bali, do not forget to visit the Ubud Art Market. This market is also known as “Pasar Seni Ubud”, located opposite the Puri Saren Royal Ubud Palace and open daily. Here you can find beautiful silk scarf, light shirt, handmade bag, basket or hat, statues, kites and many other crafts. Most of the goods found at Ubud market are made in neighboring villages of Pengosekan, Tegallalang, Payangan and Peliatan. A volcano in Bali can be the highlight of your next trip to the highlands of Indonesia. Kintamani volcanoes and Batur mountain are popular places. Mount Batur encompasses 13 km² of Batur Caldera. Adventurers who want to know what Bali has to offer can follow a winding road on the shores of the lake. This road will lead you to Toya Bungkah, Ulun Danu Batur Temple and a collection of hot springs. The Kintamani area consists of three main villages: Penelokan, Batur and Kintamani. In addition, there are some ancient Balinese villages around Batur Lake, commonly known as Bali Aga Village; Penelokan is a popular stopover as a convenient spot in the southernmost part of the limestone karst. From here, you can enjoy sweeping views of beautiful Bali volcanoes. Bali Safari & Marine Park will provide you with a fun day and one of the island’s most visited large animal parks opened in 2007. 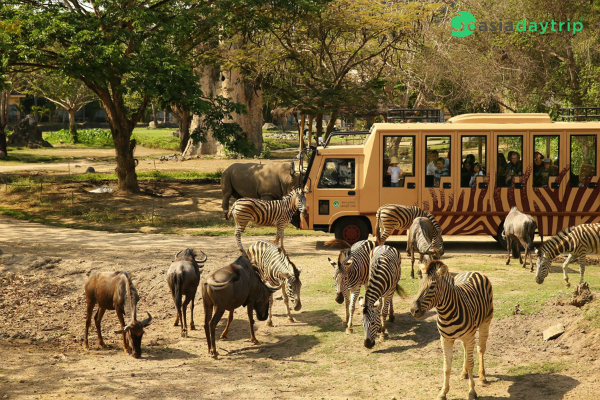 The park was established by Taman Safari Indonesia, including 40 hectares of land during the Gianyar Congress. This is home to more than 60 species, all wandering in large enclosures that mimic their natural habitat. Taking a bus is a safe way to visit animals, watch talented shows about the captivating elephant, watch the orangutan and watch sharks in the aquarium. Families traveling with children will have an explosion together at nearby theme parks. Jatiluwih’s paddy fields cover the whole land of the mountain village of West Bali, best known for its exotic and unique scenery. 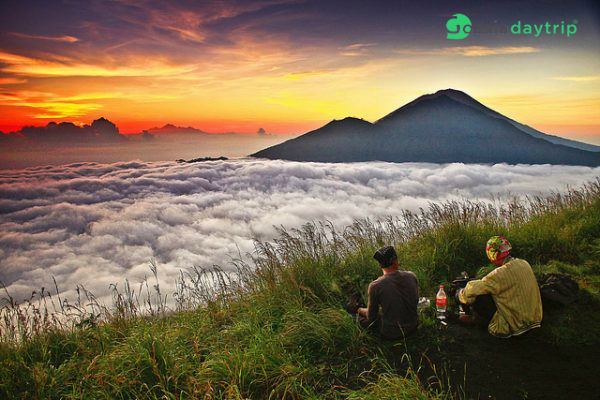 The area is one of the natural panoramas of the island on Mount Batur and the gorges of Kintamani. In addition, the breathtaking plateaus and scenery of this village at the foot of Batukaru Mountain specifically attract Bali touriss. 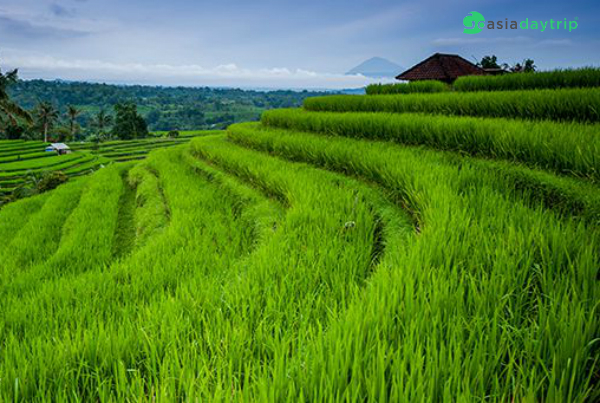 The Jatiluwih includes more than 600 hectares of rice fields in the hilly terrain of the Batukaru Mountains. This is a UNESCO Cultural Heritage candidate. Goa Gajah was built in the 11th century as a sacred place for religious meditation. The main street is within walking distance of the boulevard and parking lot, lined with various souvenir shops and souvenir shops. Upon reaching the base, you will go through a large ‘wantilan’ hall and a series of older stone paintings, some restored to their full glory before. The pool, excavated in 1954, features five of the seven statues depicting Hindu angels holding plumbing pots. The different structures show Hindu influence from the 10th century, and some of the monuments have elements of Buddhism dating back to the 8th century. Inside are 3 statues of gods, wrapped in red, yellow and black. The northern part of the compound is the mainstream Buddhism, while the south is mostly Shivaite. In the south are beautiful rice fields and small streams leading to the Petanu River – another natural site encircled by local myths. To read more travel information about Bali, please visit our blogs here.